Home Food	Oh dreidel, dreidel, dreidel, I made it of sugar! Oh dreidel, dreidel, dreidel, I made it of sugar! As Chanukah kicks off, I wanted to flex my Jewish muscles and do a project with my daughter to get in the Chanukah-holiday spirit. In my house we are lucky enough to include Chanukah in our celebration. Yes, it’s true, I am married to Clark Griswold and I’m pretty sure you can see our house from South Carolina as it lights up the Matthews’ sky. That being said, I do look forward to sharing some fun traditions I grew up taking part in with my kids. My son is too young to take part, so I did this project with my daughter after his bedtime. 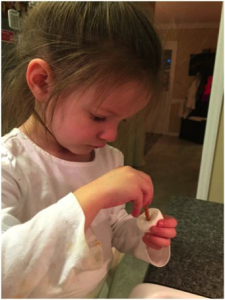 When I was a wee one, my brother, sister and I would play a common Chanukah game called dreidel, so when I stumbled across this project, I knew I had to do it! So as Gary the Elf watch over us (see him above the microwave?) we created some yummy dreidels and memories. 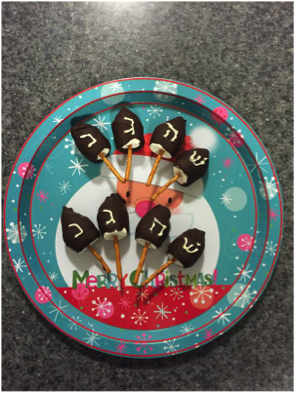 Edible Chanukah Marshmallow Dreidels by Martha Stewart. Below are my instructions, as I don’t think Martha did her project with an impatient toddler by her side. 1. Melt the semi-sweet morsels. 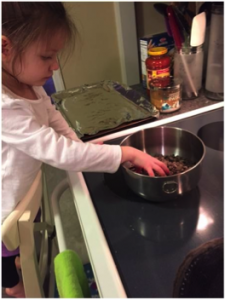 I started this process on the stovetop, but as my toddler slowly ate through a handful of kisses while we waited for the morsels to melt, I quickly changed to nuking it in 10-second intervals, mixing in between until it was melted and smooth like butter. 2. 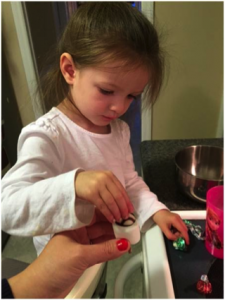 While you melt the morsels, your helper can handle quality assurance of the products. 3. Using a knife, cut a small slit about quarter-inch into one end of the mallow and inserted a pretzel stick. Do not push it all the way through. Set these on a platter. Martha calls for them to set on parchment paper, but I’ll tell you that foil works just as well. 4. Once the morsels are melted, strip your kisses of their wrapper and gently dip the flat surface into the melted morsels and apply it to the opposite end of the mallow to give it the tip of the dreidel. Gently press the kiss down so it’s somewhat secure to the mallow. You don’t need a lot of melted morsel for it to adhere. Once this is complete, pop them into the fridge for about 10 minutes to help the kisses set to the mallows. 5. 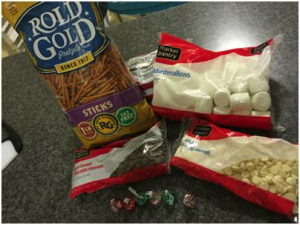 Remove them from the fridge and holding the pretzel stick, gently roll the mallow and kiss in the melted morsel bowl. I would not recommend plunging them, as you’ll lose your mallow in the deep waves of chocolate. A gentle log-roll in the chocolate should suffice. Set them on your “parchment” paper and once all of them are covered, pop them in the fridge for another 10 minutes to set. 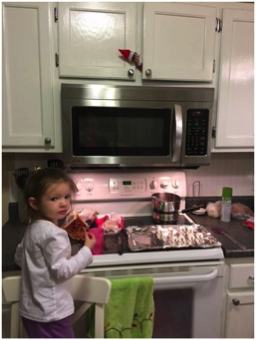 It was about this time that I lost my daughter to Peppa Pig, which was fine by me because the next step requires a steady hand. 7. Pop them back in the fridge to set and ta-da – they’re all ready! Now, as I mentioned before, we celebrate both holidays, so I saw it only fit to put my delicious dreidels on our Santa plate! Happy Chanukah! Go Unwrapped for the Holidays with the Produce Box!